As a blood red sun sets over 2017, what’s this that comes ambling over the horizon to the sound of mournful mariachi trumpets and harshly jangling guitars? 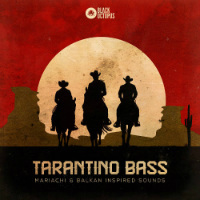 Why it’s Basement Freaks’ new sample pack, Tarantino Bass, on which the the Balkan beat bandit provides a posse of sax, trumpet, trombone, guitar, and accordion loops (among other things) influenced by the sound of both Old Mexico and south-Eastern Europe. Everything has been recorded live and arranged as ‘kits’ to facilitate an easy transition into your compositions and a highlight is over 200 sax loops grouped into four different categories as ‘Old School,’ ‘Smokey,’ ‘Jazzy,’ ‘Jammin,’ and ‘Funky.’ To get some sense of the pack’s possibilities – check out the ‘Screaming Jazz’ routine put together from samples contained therein by deejays Cris Keith, Hardy Jay and Pata on the video below. I like the way you play, boys!